Last month I was in California visiting family for a few weeks. I spent some of the time in the Santa Cruz Mountains going for long walks down the canyon with my sister and the family dog, a lovely white German Shepherd. We also went swimming at the UC Santa Cruz pool. I have never been one to see much merit in a lazy or laid back holiday. I like keeping active especially because I like eating good food. I always eat a lot when I am in California in the springtime and it is hard not to when one is surrounded by so much good food. We enjoyed delicious burritos, chips and salsa at a roadside taqueria and bowls of San Francisco clam chowder. We ate blueberries and strawberries each morning with our cereal. We also enjoyed delicious homemade spaghetti carbonara made with fresh eggs from the chickens at my stepdad’s house. One morning, when a friend was down visiting us from San Francisco, my sister suggested we go into Santa Cruz to her favourite breakfast place: The Windmill Cafe. She told us they had the most delicious sauteed veggie croissant. We drove down the mountain and then along East Cliff Drive in Santa Cruz to the delightful cafe which is an old windmill that was built in 1927 to house a family flower bulb distribution. The area surrounding the windmill was once flower fields. We went in and a friendly waiter greeted us and brought us to our table. ‘Let me just move this table a little so it doesn’t wobble’, he said to us with a smile. ‘This whole side of the room is a little sunken since the Loma Prieta earthquake in 1989’. We looked at the floor in amazement and indeed there was a crack running right through the restaurant. Santa Cruz was struck particularly hard by the earthquake. ‘Would you like to start with a cup of coffee?’ he asked us. 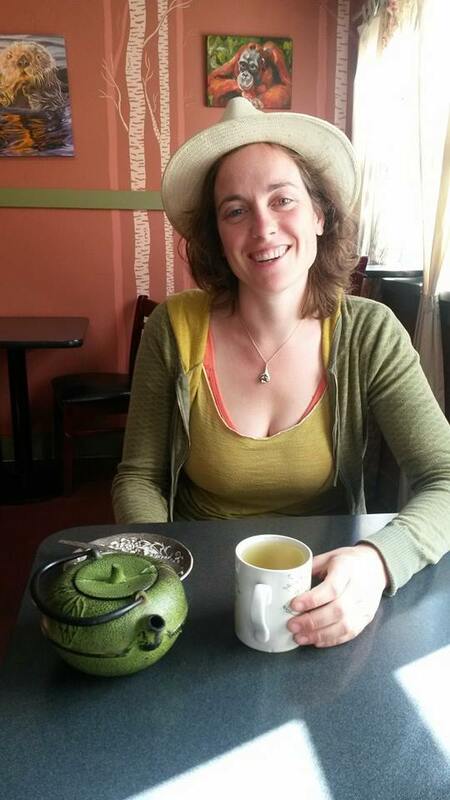 My friend and I ordered the freshly brewed French roast coffee while my sister, who has never been a real caffeine junkie, ordered a green tea that was brought to her in a lovely green tea pot that matched her outfit perfectly. The Windmill Cafe was founded in 2009 by Mary Apra who grew up in a large Italian family who loved cooking and eating good food. She has a background in permaculture gardening, design, theatre and fashion. The menu includes a range of delicious gluten free and organic delicacies such as waffles, pancakes, bagels and a Tofurito which is a tortilla filled with scrambled tofu, cabbage, potatoes, cheese and salsa. I personally would have been sceptical as to how good scrambled tofu would have tasted but I am sure it must be pretty delicious after tasting how good their sauteed veggie croissant was. 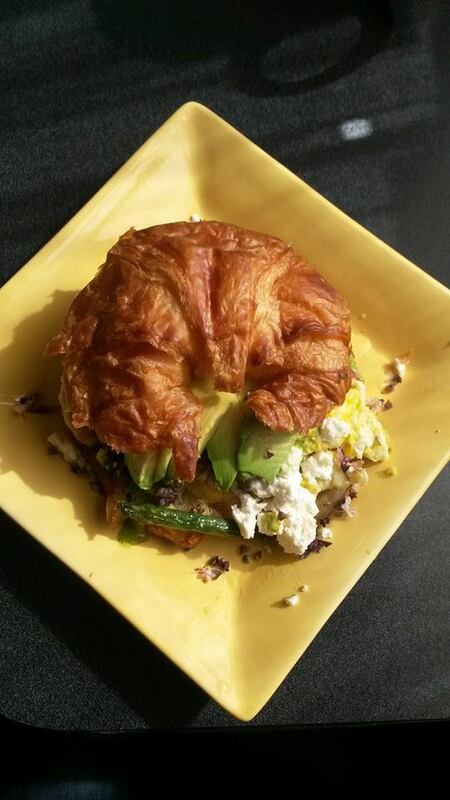 All three of, us upon the recommendation of my sister, ordered it and it was yummy: A fresh croissant filled with sauteed red cabbage, cauliflower and green beans as well as feta cheese, egg and avocado topped with a delectable honey mustard dressing. We washed it down with a glass of freshly squeezed orange juice and more tea and coffee. We then said goodbye to the friendly waitstaff and went for a walk along the beach to Santa Cruz harbour. I am very much a homebody and I love to cook. I don’t eat out in restaurants that much, but when I do I try and get new ideas for my own cooking. I would like to try and recreate this sauteed veggie croissant, but I somehow doubt I will be able to make it quite as delicious as how Mary Apra and her team of creative chefs managed to make it. 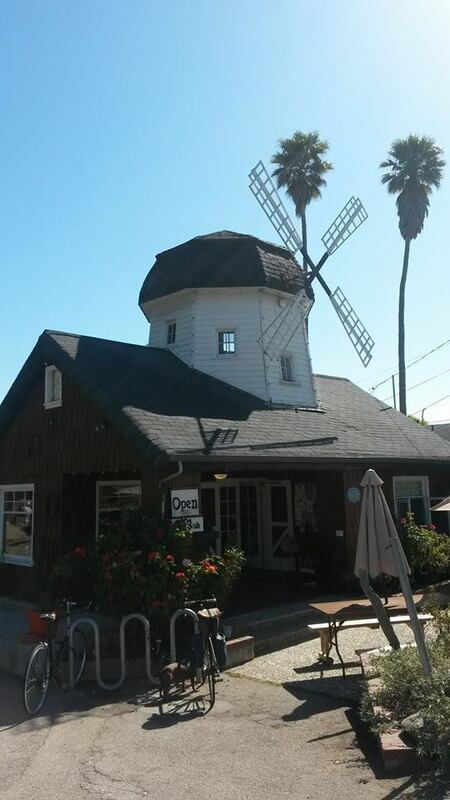 The Windmill Cafe is at 2-1231 East Cliff Drive in Santa Cruz and is open daily from 7am to 3pm.